The VRCR provides protection from man made EM pollution. 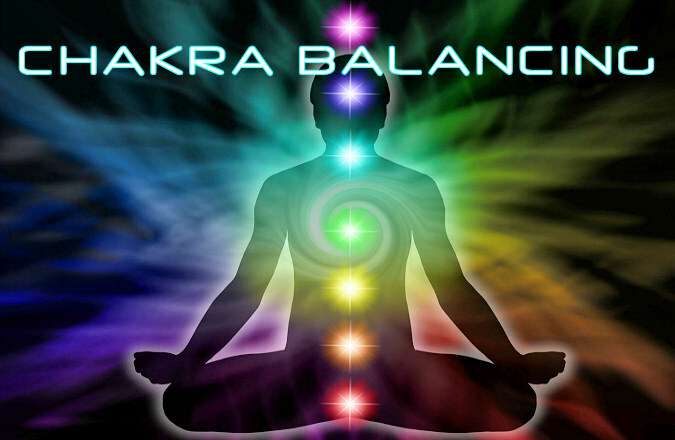 It tunes your body’s biofield while performing Chakra Balancing. I have been using this device for 7 years now and have seen it help so many people. It helped someones nerves come back to her fingers after 18 years from having a neck surgery in just one treatment. – Have many other stories too. It’s an amazing device. Even when considering all the aforementioned ways the VRCR can be used, it is still fundamentally, a Stress Reduction Technology for your whole being. The goal is to remove an overwhelming burden of stress from your being so YOU can do your own healing. There are many of these biological stressors present in your daily life. 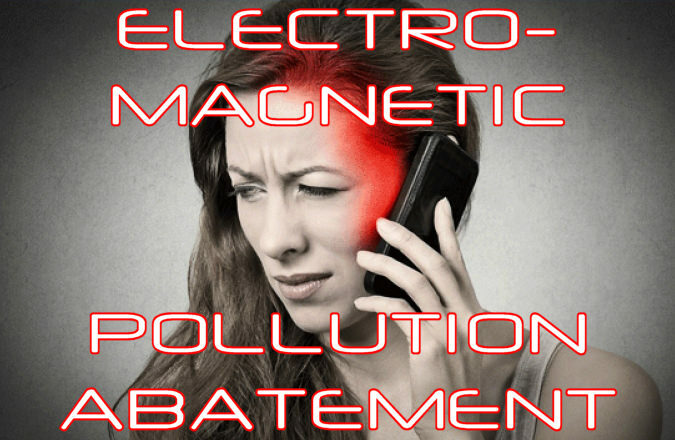 Some of the biggest threats to your health are unseen EM-pollution signals from our modern world of power distribution and electronics technology. No matter what so called authorities or big business mouth pieces say, the EM Pollution Health Threat to people, wildlife and our planet is very real and proven. Only in the last several years have sciences such as Epigenetics and Signal Transduction been able to show just how sensitive biology can be to such EM pollution signals. By signals, we mean not only energetic but quantum information signals as well. What’s even more shocking is finding out that EM signals can even select the expression of our genes and, along with our own beliefs and perceptions, control whether or not we move into a state of ill health and disease. 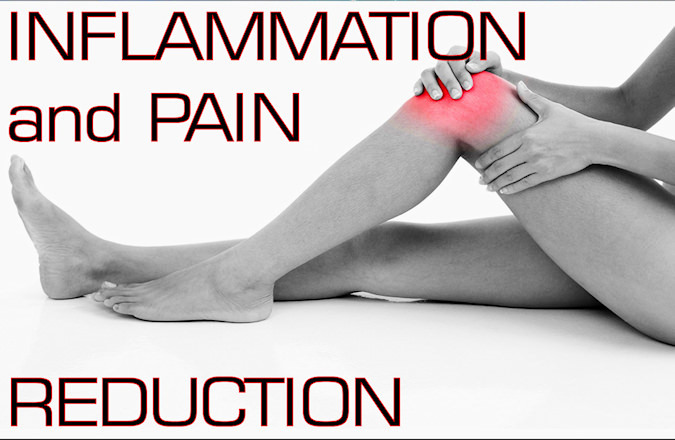 The good news is that, given the chance, your body has an amazing ability to heal itself. But in our fast paced, high stress world, we need all the help we can get to bolster our holistic health maintenance regimes. So, the VRCR helps you to address health threat issues that your exercise routines, diet or even the mental wellness habits that you keep, can barely touch. The VRCR design was intuitively guided to be a blend of ancient crystal wisdom, modern electronics and advanced, Nikola Tesla technology. It also harnesses proven principles of quantum mechanics; including those from the new scientific field of inquiry called Quantum Biology. 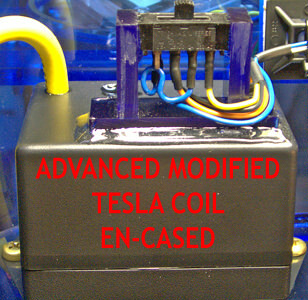 It includes an Advanced Modified Tesla Coil, AMT Coil for short, that is basically the engine of the VRCR. This combination produces the Violet Ray and other harmonic frequencies capable of harmoniously interacting with our electromagnetic bio-fields or chakras. 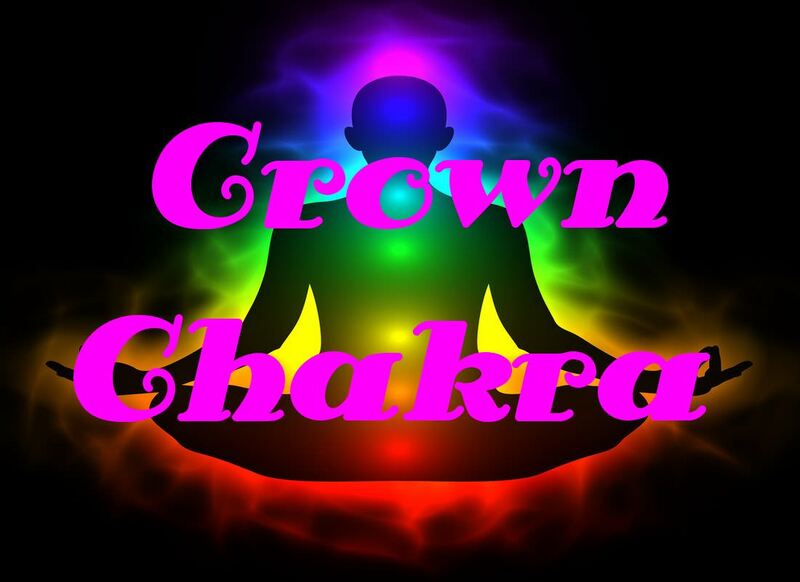 The chakras are being balanced and tuned as a highly advanced form of Chakra Balancing more commonly known to alternative health practitioners and energy workers. 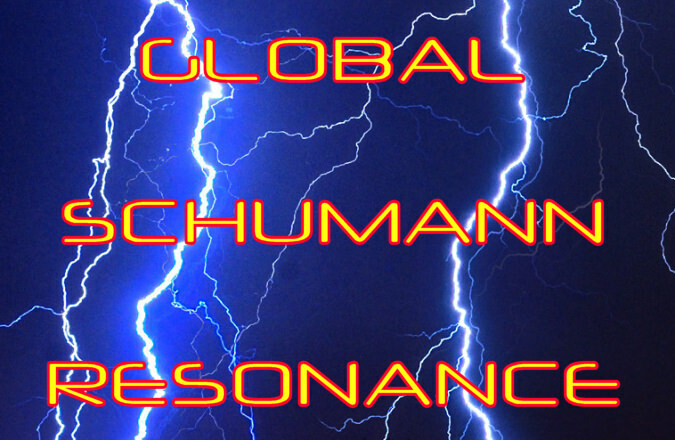 The evolutionary makeup of our biology expects and depends upon the presence of the Earth’s subtle EM pulse called Schumann Resonance. So there is a healthy balancing of the chakras needed in relationship to this Schumann Resonance. In addition, there is a healthy tuning of the chakras in relationship to each other. The VRCR’s energy and field information are also accessing not only our physical being but also our subtle energy bodies through quantum field processing. 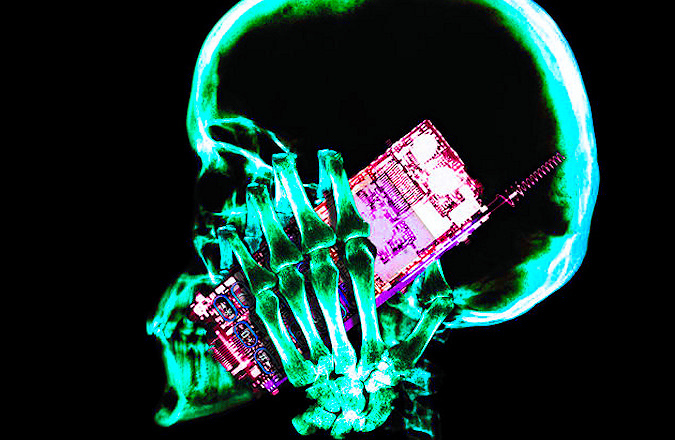 frequencies and is the heart or engine of the device. They are used in all the various modes of VRCR operations. CARRIER WAVES – Lower Frequency – 16 Chakra Balancing settings – Each frequency is a successive doubling of the frequency below it. They are all octaves of the Earth’s Schumann Resonance. The lowest Chakra of your body is tuned with the lowest frequency setting. The highest Chakra of your body is tuned with the highest setting and so on. These Chakra frequency settings tune the EM fields of your body. Your chakras or bio-field, ganglionic centers have EM pulses separate from your physical or cellular vibration rates. (Don’t confuse other energy entrainment systems that work only at the physical cellular vibration rates with our VRCR system that works with the chakra’s own EM vibration rate.) Your bodies Chakras are linked to the Schumann Resonance field of the planet and it is our Earth pulse which keeps our bodies in equilibrium. The pulse is so important that spacecraft must have Schumann EM generators installed to help stabilize astronaut physiology since Schumann Resonance is not available in space. The goal then, is to re-balance and tune each chakra to its own Schumann octave, and then allow the chakras “built in, innate wisdom” to regulate all physical processes under its control. Therefore, these waves interface directly with your Chakras while they also serve as carrier waves and a powered delivery system for the Subtle Energy Waves. SUBTLE ENERGY WAVES – Higher Frequency – These are subtle, lower energy, super high frequency waves that are superimposed upon the lower frequency carrier waves. Due to the AMT Coils unique construction, plus coil interactions with inspired circuitry design and a holistic feedback regulation system, these harmonic quantum waves are also generated. One exception to the subtle nature of these quantum waves is the obviously more powerful Violet Ray energy. 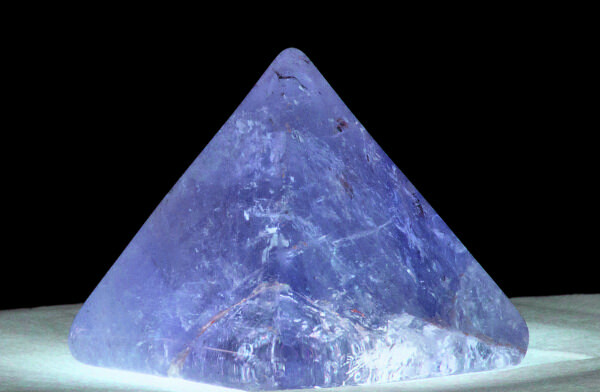 In combination with the heart center carrier frequency and other lower settings, the Violet Ray energy can be clearly felt and even seen as it manifests into Violet Light inside the Violet Ray Bulb attachment. These subtle energies are a mixture of standard physics energy, quantum energy and information fields. The subtle, quantum energies produced within the VRCR were described with a more esoteric tone in the early years of the design as: the Violet Ray, Golden Ray, Elemental Ray and the Double Fold-back Violet Ray. They are all present at every chakra setting but each may be more pronounced at certain frequencies. Consider these special energies as a holistic combination of subtle, quantum energy and information fields. 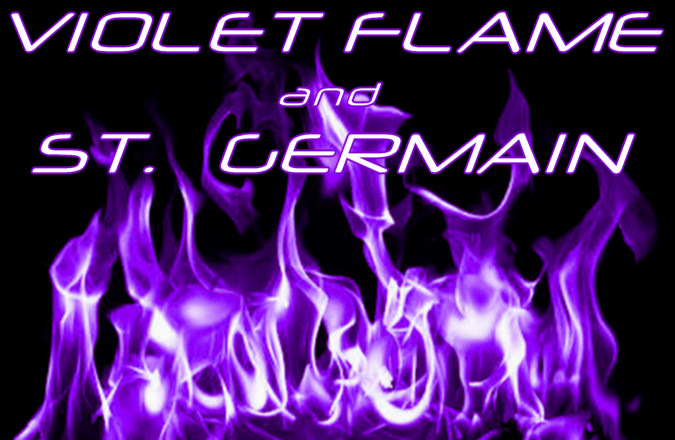 These energies, especially the Violet Ray, tap into humanities etheric blueprints. 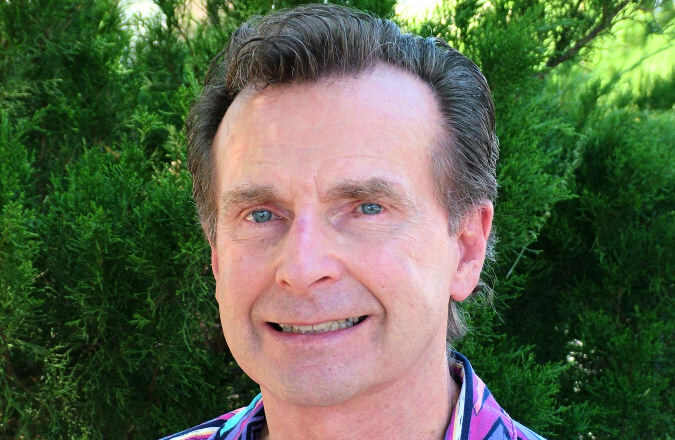 According to the higher wisdom that Jack Derby received and esoteric sources such as Saint Germain, the Violet Ray quantum field is the original energy and animating source information code of humanity. Like our DNA genes themselves, these quantum codes can be expressed or programmed to be out-pictured in many different ways. The Violet Ray energy in particular, catalyzes the VRCR’s access to quantum information programming. 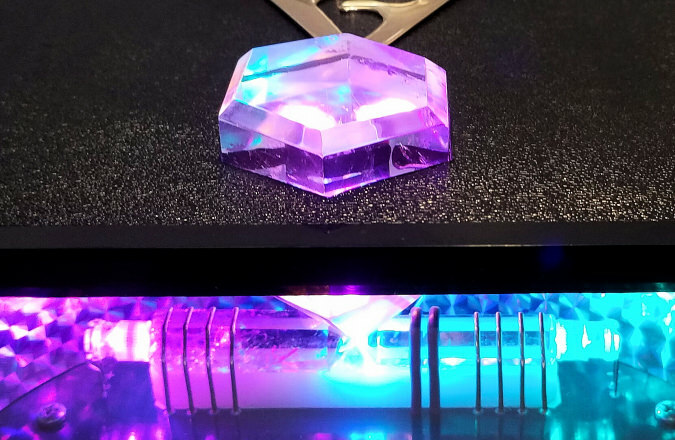 When the Violet Ray is coupled with the energy attraction of the scalar antenna, the memory capacity of quartz crystals and their piezoelectric properties, and the rest of the device in holistic connection, the VRCR becomes the world’s most coherent and potent Radionics device. 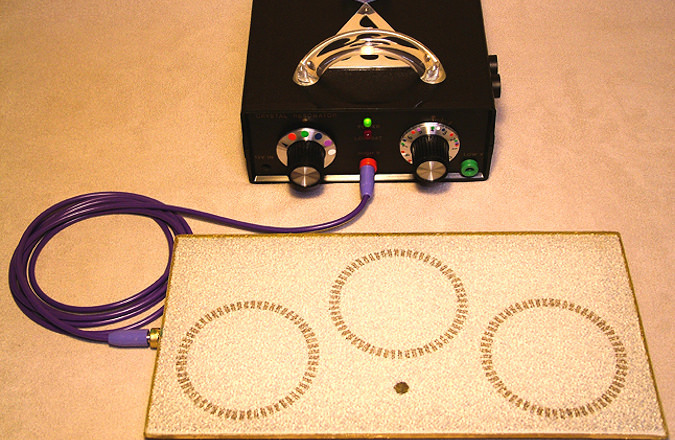 ALL 16 EMF WAVES ARE PRODUCED IN THE AMT COIL – and controlled by adjusting two knobs on the VRCR front panel. 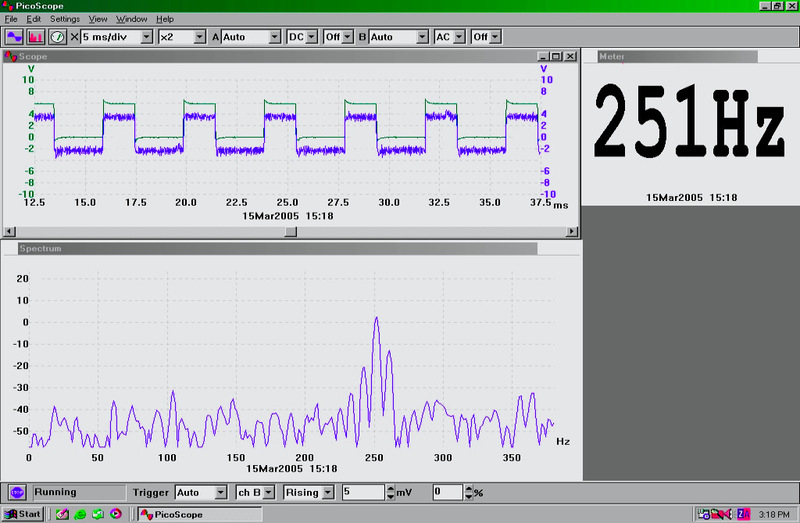 Follow this link for more on Setting Frequency on the VRCR. THE AMT COIL IS ALSO CALLED THE “ENERGETIC FOCUSING AMPLIFIER” – and is the result of both divine guidance and much trial and error research. It is a custom component; since nowhere in the world was one to be found with the necessary qualities. Its output voltage is quite high and has subtle energetic qualities that make it virtually immeasurable by most common metrology gear. The coil outputs roughly 90,000 volts developed by a pulsed DC input. Normally, your body never comes into direct contact with it but instead, the charge is delivered through implements which buffer it through glass. The output power is very low and it is supportive to the self healing ability of the human energy system. Its implosive output energy is also different than Tesla type coils. In fact, the configuration design transcribed for this AMT Coil is so odd, that according to normal electronic engineering theory, the device should not even work. But it does. In fact, it will not work unless every one of its strange modifications is present. CO-CREATION ACTIVITY MORE COHERENT AND AMPLIFIED – Together, the AMT Coil (Energetic Focusing Amplifier), Triad Antenna (Etheric Energy Collector), and the Crystal Array (Quantum Energy Transducer), create an energetic pathway that has a radionics function as a Thought Form Amplifier, among many other functions. This ability makes the VRCR a powerful tool that can help you create better and more coherent intention and prayer outcomes. CRYSTAL MATRIX TREATED AMT COIL – protects, strengthens and increases coherency of coil tuning. Coil is potted or is treated with a Quartz Crystal dust coating. The coil’s EM field stimulates the quartz dust to act as one large encasing crystal and serves as quantum field protection from any destabilizing quantum influences. Thus, it ensures coherency of energy produced and further amplifies coil output strength. Subtle EM stimulation of the Quartz piezoelectric effect activates a quantum entangled field connection to the memory and intelligence of Earth’s natural Crystal Light Grid and makes its healing influence instantly available through the VRCR. CRYSTAL MATRIX TREATED VRCR CASE – All VRCR functions are further protected by another special treatment of crystal dust coating on the inside of the VRCR enclosure. As with the crystal dust coated AMT coil, the crystal dust treated case acts as one, crystal enveloping and protecting the entire unit from any destabilizing quantum influences. MULTI-MODAL ACCESS TO EARTH’S NATURAL CRYSTAL LIGHT GRID – Subtle EM stimulation of the Quartz piezoelectric effect activates a quantum entangled field connection to the memory and intelligence of Earth’s natural Crystal Light Grid and makes its healing influence instantly available through the VRCR. Demonstrating the quantum physics attributes of the “action at a distance” phenomenon, the VRCR effectively becomes a satellite transmitter/receiver substation of Earth’s entire crystal grid. This means that your radionic prayers and intentions are also transmitted to Earth’s crystal light grid. You also receive support back from the Earth’s crystal light grid. More accurately though, the VRCR’s connection to Earth’s crystal light grid is more about quantum entangled states of resonance rather than transmission or reception of signals. Point blank simplified? The VRCR is your multi-dimensional access portal to Earth’s entire crystal light grid. You can let it serve you and you can serve it while all interactions are protected and transmuted to be of Christ consciousness level or higher. SPECIAL NOTE: PROTECTING THE EARTH’S CRYSTAL LIGHT GRID – One of the initial reasons Jack was intuitively instructed to build the VRCR was to help protect Earth’s crystal light grid from any destabilizing consciousness or quantum influences. 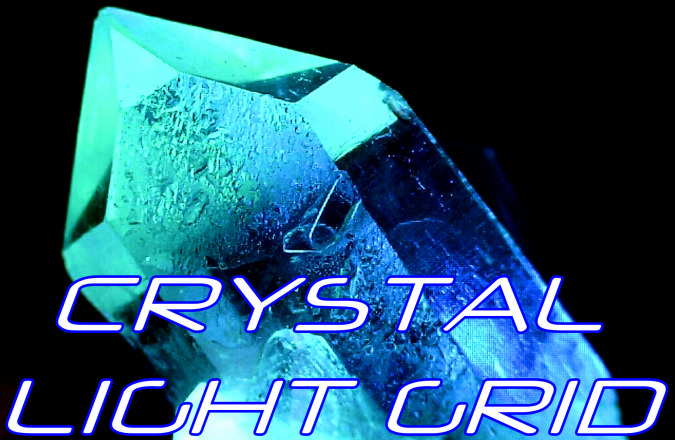 Catastrophic events long in humanities past, such as the downfall of Atlantis and Lemuria, can no longer happen as the Earth’s crystal light grid is now fully protected by the presence and use of VRCR’s all around the planet. 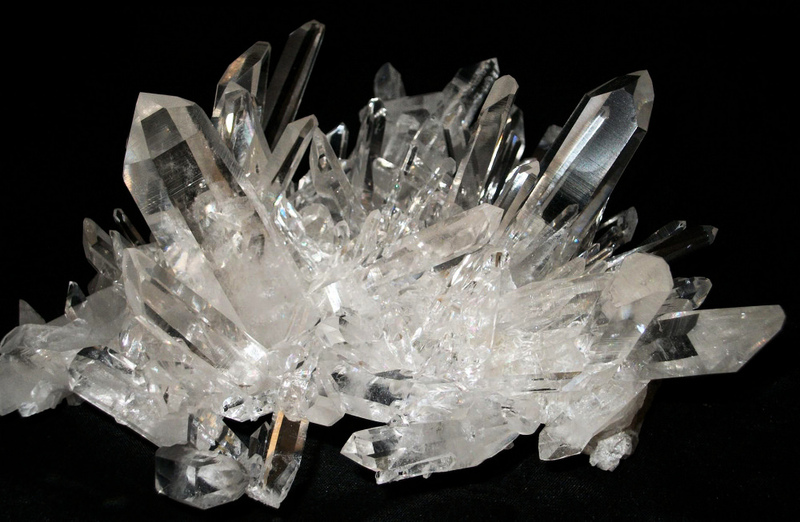 CRYSTAL ARRAY TRANSDUCER – transmutation of energy/information. 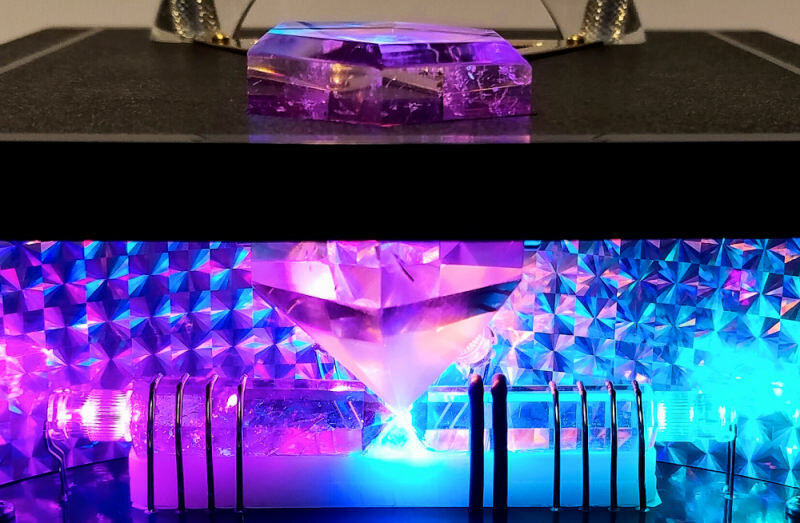 This set of 4 crystals (3 visible) are made up of the LEFT Control Stabilizer Crystal, the RIGHT Power Crystal and the large, standing VERTICAL Programming Injector Crystal. The energy and information flow through the Crystal Array is complex and changes with modes of operation and intended use. Direct Current (DC) pulses are being applied to the AMT Coil and Control Crystal by the left half of the Gold Wire Scalar Antenna Coil – as seen wrapped around the crystal. These control pulses serve as grounding, reference and governing vectors or agents of change. The AMT Coil high volts output energies are routed to and wrapped around the Power Crystal and introduced through the right half of the Gold Wire Scalar Antenna coil. 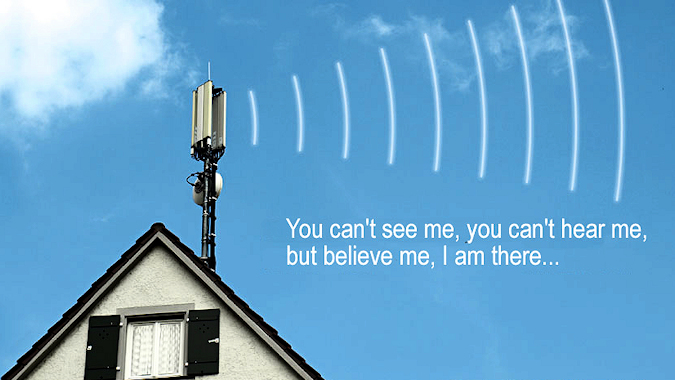 The halves of the Scalar antenna are held at an electrical imbalance enabling Zero Point Energy to collect between them. 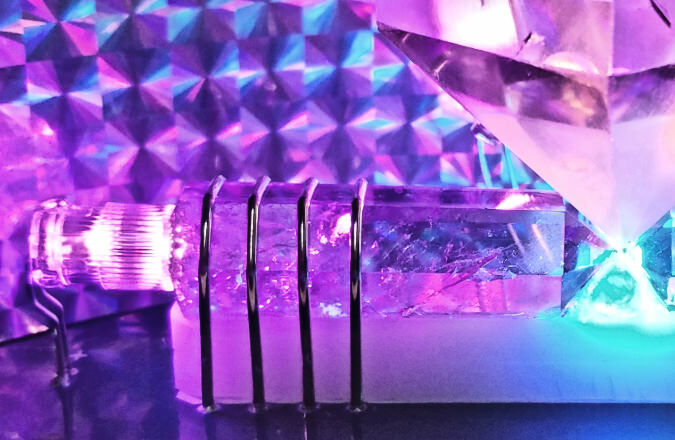 The Power Crystal utilizes its transformative Piezoelectric nature; converting the high voltage to subtle, quantum energy and field information. The same energies are present at the VRCR front panel High and Low Volts Output connectors. 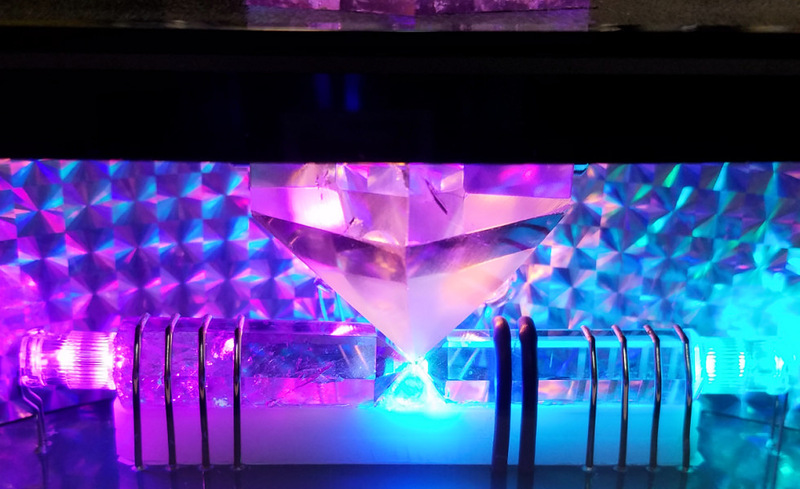 THE VERTICAL PROGRAMMING INJECTOR CRYSTAL IS BATHED IN ELECTROMAGNETIC FIELDS – along with two high strength magnets contributing to the multi-directional flow of energies in the system. These magnetic fields draw energy down in from the top of the Injector crystal and down towards the meeting point of all the array crystals. EMF fields, quantum, etheric, light, magnetic, piezoelectric, scalar and even sound, meet at the FUSION POINT, or apex of crystal points, where multi-directional and multi-dimensional conversions take place. PROGRAMMING THE INJECTOR CRYSTAL – This crystal is programmable by your feelings, prayers and intentions. Collectively, the memory, conductivity and piezoelectric energy of crystals plus the Violet Ray, magnetic, electromagnetic pulses, quantum energies, scalar energies, etc., make it possible to program and record your co-creative desires into the crystal in a highly focused fashion. 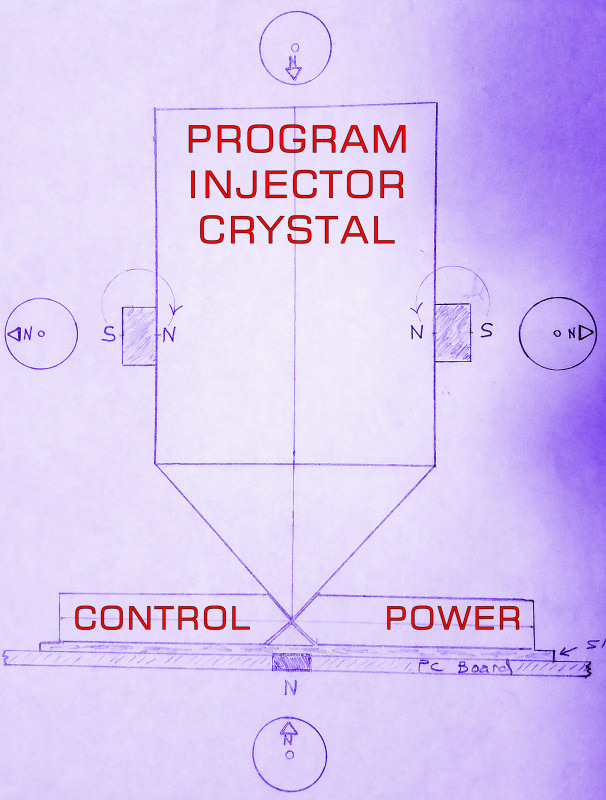 The Injector crystal can store and, in a sense, loop play your programming. The program is of your intentions and prayers and they can be transmitted 24/7 while the VRCR is on and using the 4 sided Antenna attachment. 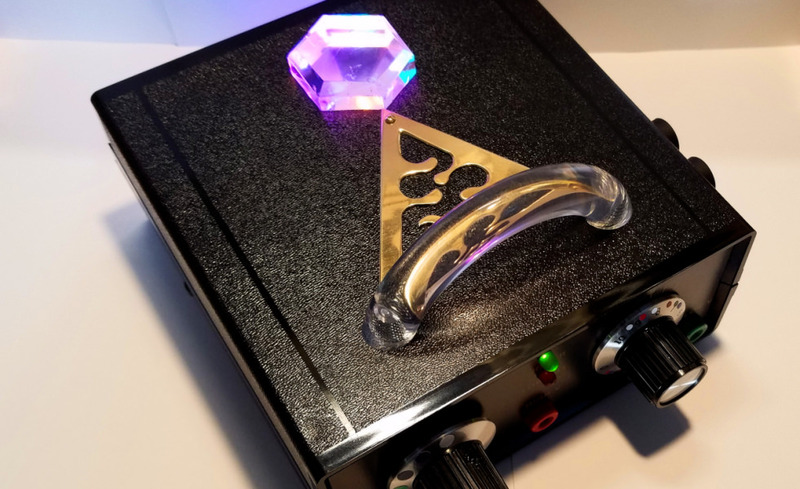 The best way to program the crystal is to use the conductive Programming Brass Wand as a pen and write out your intentions as you feel them on top of the Injector Crystal itself. There are several setups and 16 different frequencies that you may use while performing the programming operation. Through many years of experimentation, we determined that the best overall setting to use when programming the Injector Crystal is the Christ Consciousness or the 14th – Crown/I Am Chakra. Though LOVE energy is the most healing, the Christ Consciousness energy provides the higher awareness about LOVE energy and how to use it. For very specific prayer and intention programming, you might want to consider the energies involved for each Chakra frequency setting as they are described in the manual. Then, set the VRCR to the chosen setting as it is most relevant to the type of programming you wish to do. Once complete, the Injector Crystal will hold the program even if the VRCR is turned off. You can input multiple intention programs and change or erase them at anytime. You’re in charge. There are also other ways to program the crystal including group programming. Another great use for the VRCR is to use it to help program your own favorite healing crystals. You can also use it to cleanse them with its Posikiation process. SPECIAL NOTE – Negative programming is not possible. The VRCR is regulated to output nothing less than Christ Consciousness levels of information fields and quantum energy. MOLDAVITE – THE 4TH HIDDEN CRYSTAL OF THE CRYSTAL ARRAY – Below the apex point of the other 3 crystals of the Crystal Array Transducer Assembly is a small piece of Moldavite. Moldavite is imbued with celestial qualities that boost the Golden Ray energy. In turn, that provides you with more connection to Cosmic Consciousness information codes. The apex FUSION POINT is where all 4 crystal points meet. It is bathed in a magnetic field produced by a powerful magnet placed underneath it that directs energy flow through the Control and Power crystals. THE ARRAY CRYSTALS ARE CUSTOM CUT BY VOGEL CRYSTAL MAKERS – The special crystal designs, i.e. dimensions, faces, angles, etc., enhance the Posikiation effect in a natural and subtle way. The Quartz Array Crystals cutting design DOES NOT optimize them for maximum piezoelectric tuning at the physical level; as it is with crystal oscillators that can be precisely tuned and used in modern electronics. Rather, the main job of the Array Crystals is a quantum one. So they have more of a naturally designed quantum focus rather than a finely tuned physical one. More precision and power does not always get you quantum field access. In this case, “easy does it” is a more amiable way to coax quantum energy and information fields into cooperating within the Crystal Array Transducer Assembly and the Scalar Antenna Gold Coils. POSIKIATION – TRANSFORMATION OF CHI – During the high cycle period of the DC pulsed AMT Coil energy, positive life force energy (chi or ki) is pumped into your body through the Crystal Wand attachment; creating a momentary high pressure within your body. Then, during the low cycle period of the DC pulse energy, the pressure is removed & negative energy rushes out of your body through the Wand and into the crystals of the VRCR known as the Crystal Trinity or Quantum Energy Transducer. At the FUSION POINT of the Crystal Trinity, any negative energy is irradiated with all the focused energies and information sets converging there. This converts the nature of the negative energy into positive Ki or chi with increased strength. Through this entire process, the Violet Ray Energy is always present and superimposed upon the pulsed DC carrier frequency. The energies that are pulled into the VRCR from your body are then radiated with the Violet Ray as a major part of their transformation. Upon the next high cycle period of the DC pulsed energy, the high pressure of the EM, Violet Ray energy from the AMT Coil pushes the amplified and positive ki back into your body. This Posikiation process can thus transform your negative chi into positive chi very quickly. 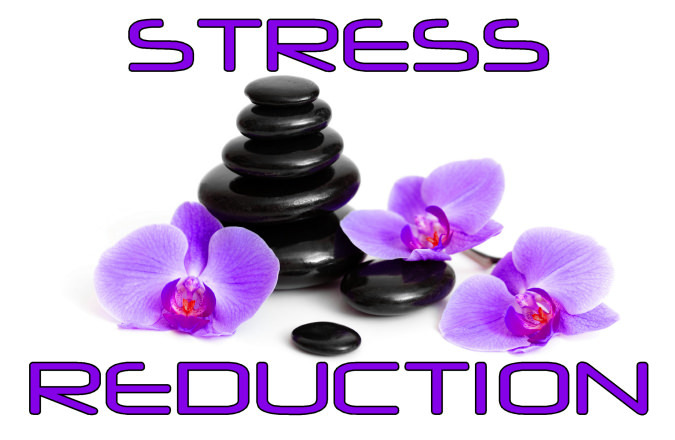 The result is increased biological stress reduction. 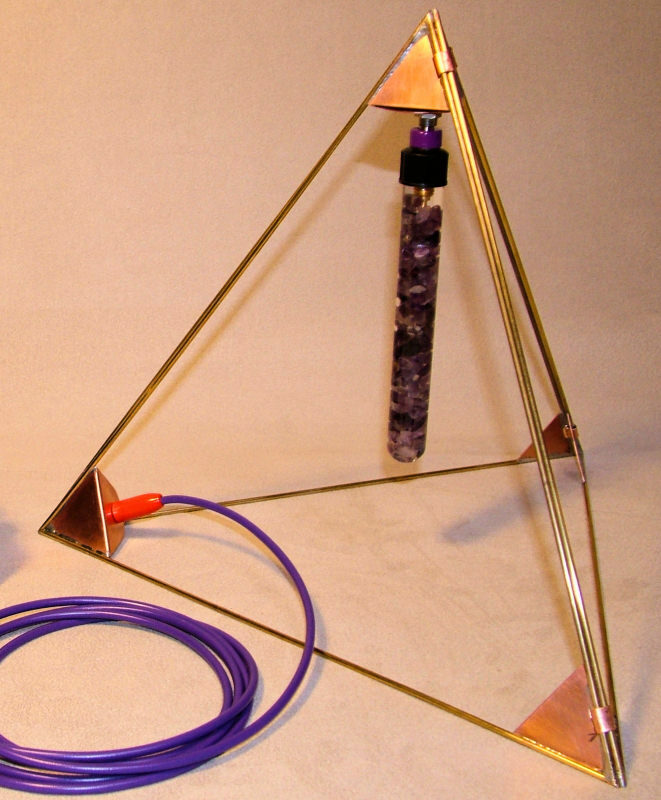 TRIAD ANTENNA IS A QUANTUM, ETHERIC ENERGY COLLECTOR – primary function appears to be the reception of quantum information and etheric energy. But equally important is its function of self regulation as part of a quantum feedback design. 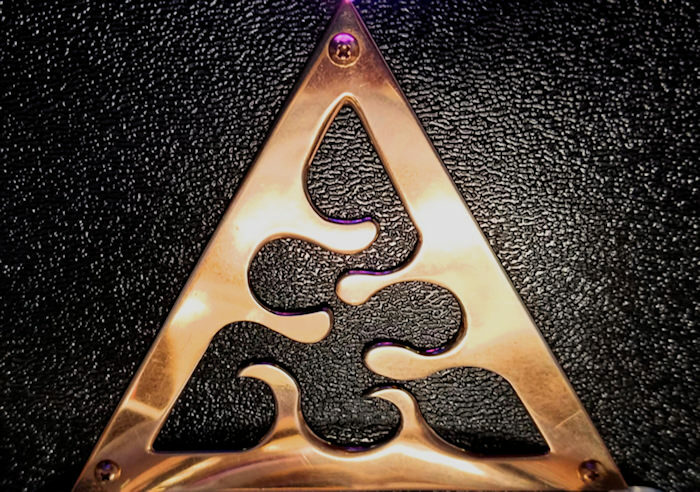 On top of the VRCR case is the gold plated silver, triangular shaped “Triad” symbol. Long ago, an ancient peoples lived near what is now Lake Titicaca, Bolivia. The shamans realized that their people were losing connection with higher awareness. To help, they created skull caps for everyone to wear on their heads that were this very shape called the Triad. 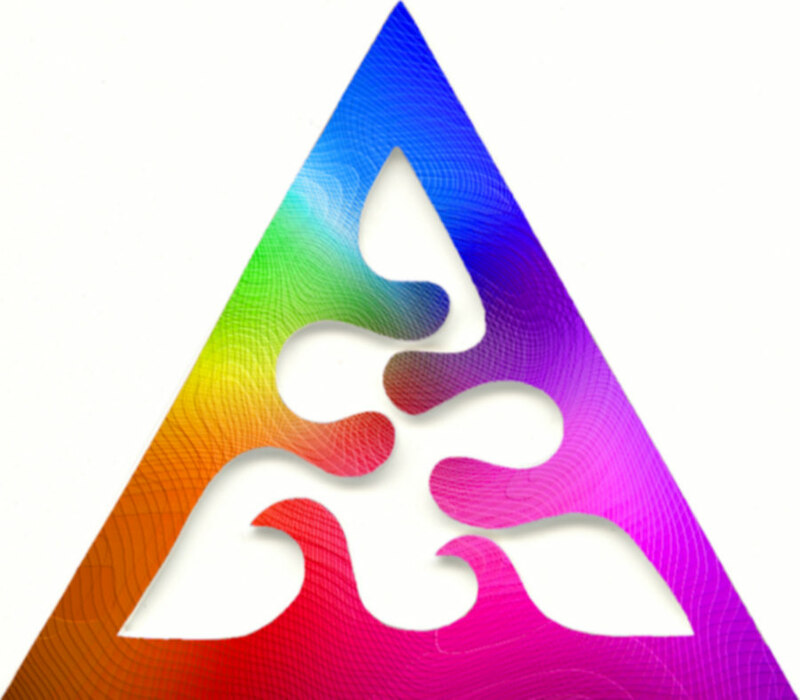 The Triad’s sacred geometry shape helped to translate the more subtle quantum fields or god consciousness into information that their brains could still receive and comprehend. In doing so, they extended the peoples dwindling conscious connection to source awareness. Jack was intuitively guided to use this shape in combination with a very sensitive Germanium Diode circuit to receive the quantum fields of universal intelligence. The Triad – Germanium circuit connects the Injector Crystal with the control board electronics of the VRCR and other assemblies to provide system feedback regulations and reception. This interconnection includes a tuned coil around the Injector Crystal sensing any fluctuations of information and energetic flow. 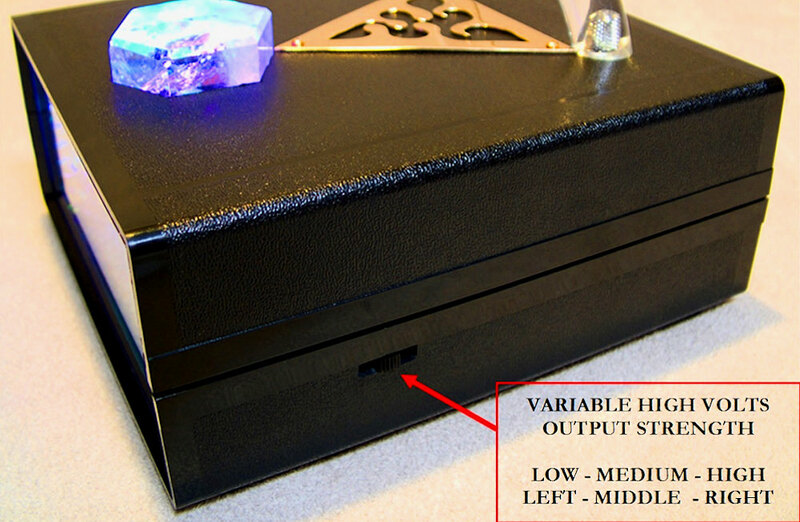 Amethyst Crystal and the Germanium Diode circuit are inside the VRCR case and directly below the Triad shape. Gold and Silver help to boost this connection. The Triad assembly stimulates the Crown Chakra, Pineal Gland & Hypothalamus. Amethyst brings in the supervision and energy of Lady Holy Amethyst. 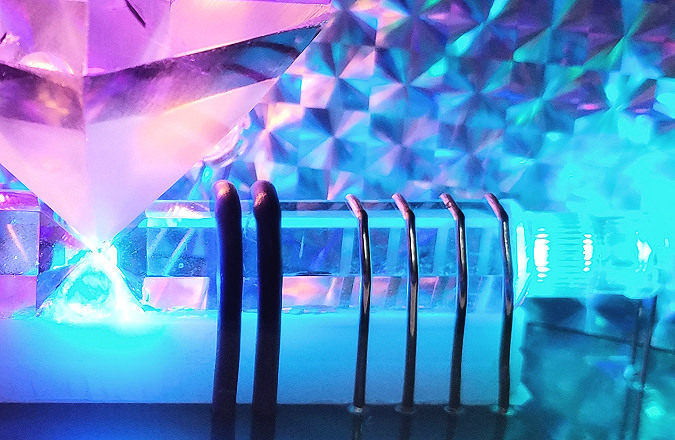 PULSING LIGHT EMITTING DIODES – Blue, Cyan, Violet and Golden LED’s shine into the Crystal Array Transducer Assembly further activating coherent quantum fields and energetic transduction processes. CRYSTAL FOOD PLATE ENERGIZER – structures and energizes food and drink or whatever you set upon it. Our bodies structure by percentage of number of molecules, is 99% water. VRCR treatments upon your body structure the water within just as Pillar of Light’s dedicated water structuring device, the WoLF does. The WoLF is supremely attuned to the water structuring task and uses some of the same energies as does the VRCR. The AMT Coil is the basis for all frequency production in both; whether it be for carrier waves or subtle quantum waves as the Violet Ray. So don’t discount the VRCR’s structuring ability on water and food. 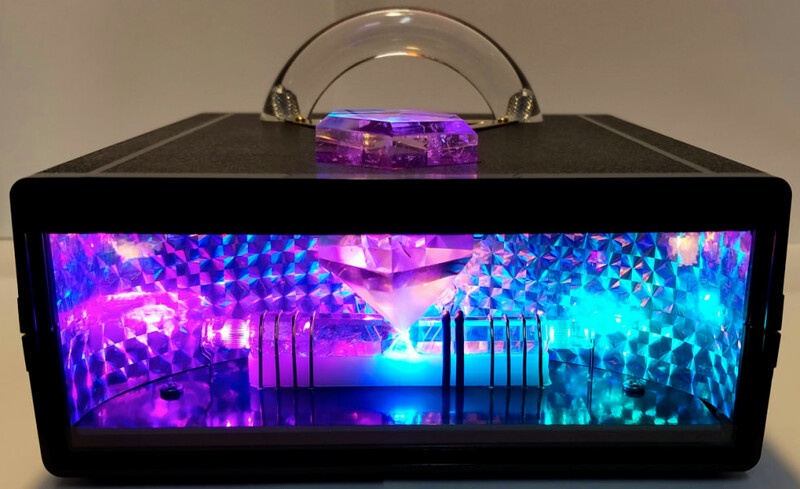 Simply set a glass drink upon the Crystal Food Energizer Plate and set the VRCR to the Heart Center Frequency; the strongest coil energy with the most powerful manifestation of the Violet Ray energy. 30 seconds of energizing and your drink is revitalized and likely tastier as well. And the same goes for food. Plants even like it. You can bring wilting flowers back to life and watch them perk upright practically right before your eyes. Though we suggest using more subtle settings than the Heart Center for plants, as it can overcharge them when not being used to such high energy. VIOLET RAY BULB ATTACHMENT – used mostly for symptom relief inside and out – from pain and inflammation, accelerated healing, knock out opportunistic organisms in your bloodstream, etc. 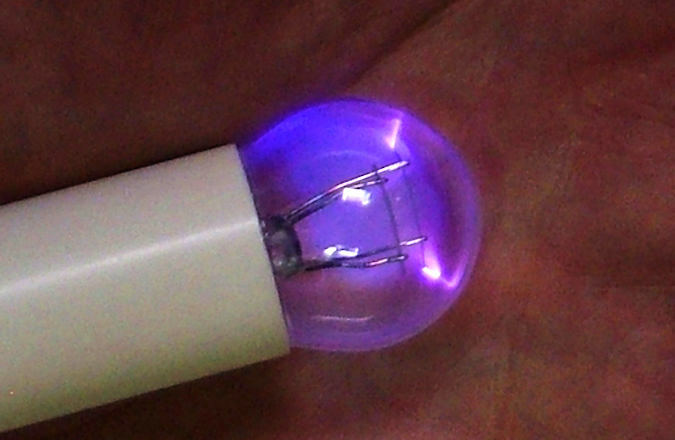 The bulb is intended to be used on the Heart Center frequency only as it generates the strongest coil output capable of creating the Violet Arc inside the bulb. The VR bulb delivers the visible violet light manifestation of the Violet Ray Energy. 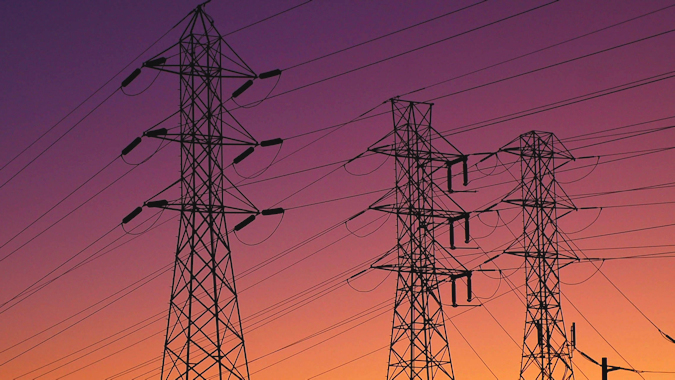 It is roughly 90,000 volts of bio-compatible, pulsed DC energy that’s also very low current and power. The Violet Light arcs within the bulb when you touch it to your body. it arcs violet inside even when connecting to your body through your clothing. The Violet Ray energy is so unique, it can go through a circle of 100 people or more holding hands and still arc the bulb without loss of energy. It is not intended to be any stronger in intensity than it is. Bio-compatibility is subtle and we highly suggest that any other devices developing higher or more visible energies than those of the VRCR be avoided. 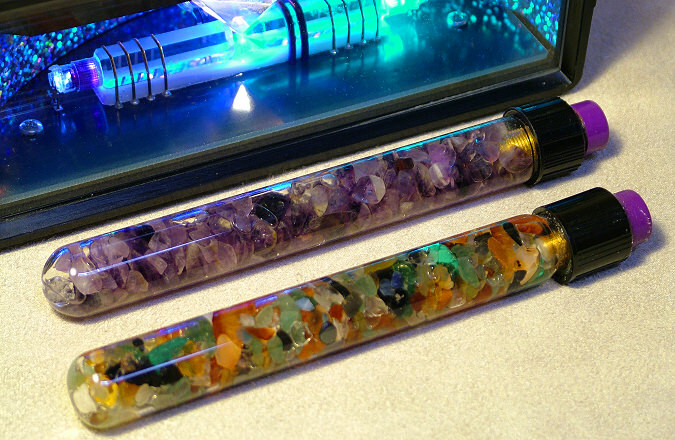 CRYSTAL WAND ATTACHMENTS, MIXED AND AMETHYST – These are also conductive charged wands that can be used with any frequency setting. They are the primary tools of Chakra Balancing and Tuning. Many special uses are described in the manual. When using more powerful settings, you can feel the crystals inside the glass wand vibrating. You can also hear it if held up close to your ear. 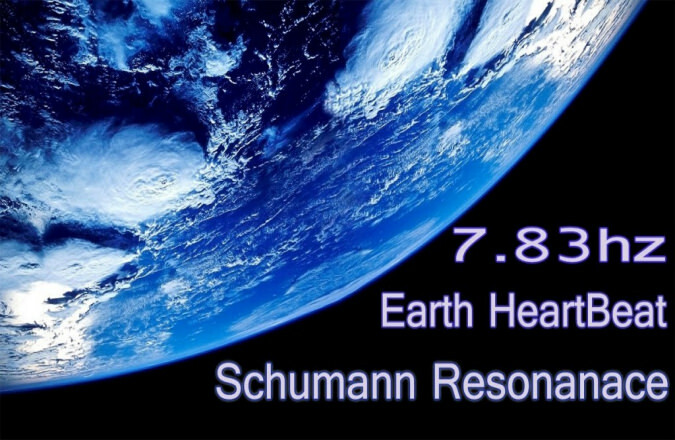 GLOBAL SCHUMANN RESONANCE MEASUREMENT STEADY AT 7.83 HERTZ – with only the smallest of natural fluctuations. The VRCR frequencies are all based on Schumann Resonance so we’d like you to understand that Schumann Resonance (SR) is stable. The SR pulse has enveloped all of life on Earth from the beginning. Our biology expects it. But occasionally, someone comes forward and claims that the Earth’s set of Schumann Resonant Frequencies are increasing. They use that supposed fact to support ideas of human global consciousness shifts. Usually, their extrapolation of such information comes from some bit of data taken out of context and then misconstrued. One reason why various opinions crop up is because direct SR measurement data is now harder to find. Scientist have believed that the set of global physics criteria that govern the frequency of Schumann Resonance is so stable and set in stone that it is not measured directly and consistently around the world as it used to be. The Earth’s size is strongly involved with the equations that determine SR and science believes that the Earth size is remaining the same. There are weather criteria, celestial waves and the Earth’s magnetic fields that fluctuate, but their effects upon Schumann Resonance are minimal. So science has strongly witnessed and further assumed that SR is very consistent. So, instead of continuous measurements of SR directly, they now study and measure SR in relation to learning more about weather patterns, geomantic activity and solar affects on the planet, etc. Unfortunately, that leaves many pseudo-science philosophers guessing about what’s going on and twisting facts to fit their preferred stories. According to our latest research, the facts about SR remain that even with global warming, magnetic field shifts and weather changes, Schumann Resonance is stable and centered around its historically expected nominal frequency of 7.83 cps. So Pillar of Light continues to use Schumann Resonance as its primary focal point for stress reduction, frequency entrainment. That being said, even if Schumann Resonance, or any other natural environmental energy vibration, were to noticeably shift, the Triad Antenna receives the quantum information and adjusts the flow of energies within the VRCR accordingly. The self regulation feedback system would adjust to any minor change. Major rapid changes in Schumann Resonance could be catastrophic for humanities well being but are not foreseen to be of potential. 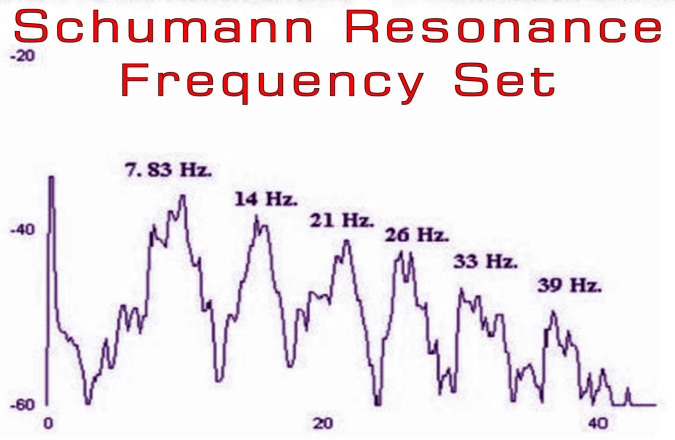 VRCR HEART CENTER FREQUENCY ATTUNES US TO RESONATE AT 250.56 CYCLES/SECOND – This is directly 5 octaves higher than the Earth’s Schumann Resonance Frequency of 7.83 cycles/second which is the base resonant pulse of the Earth. The Heart Center frequency is also the musical note “B”; based on a slight corrective adjustment to concert pitch termed “cosmic pitch.” Intuitively, Jack knows that the human electrical Power Centers or Chakras ideally vibrate at harmonic octave levels of that base frequency. 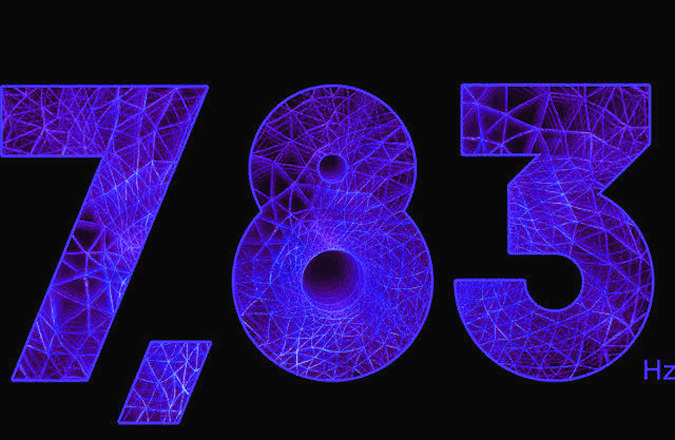 The VRCR Heart Center Frequency is a “DC pulsed carrier wave” for the Violet Ray Frequency of 732 trillion cycles/second. Pulsed DC rectangular wave is 250.56hz carrier frequency. The small, high frequency content riding upon the square wave is the Violet Ray energy and others. Hard to measure. This measurement was taken with a Radiant Pickup sensor 1 meter away from the 4 sided transmission antenna. 5th Octave up from Schumann Resonance of 7.83cps. 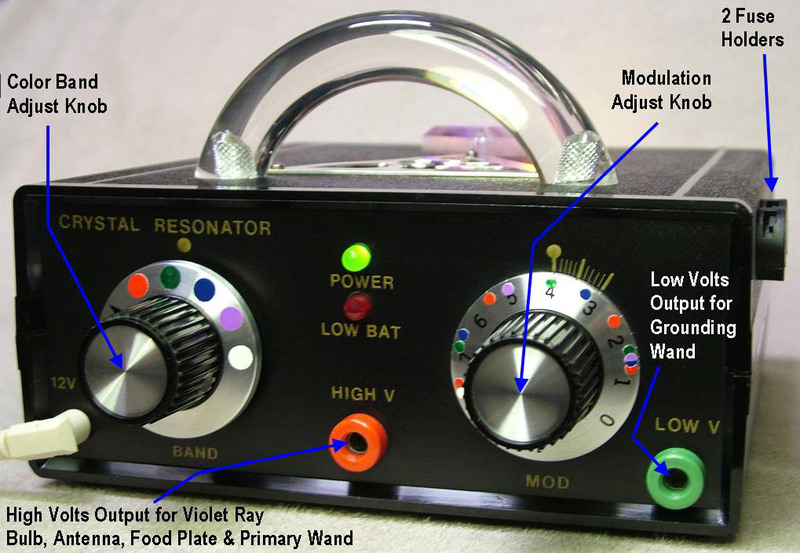 WHAT IS THE VIOLET RAY CRYSTAL RESONATOR? “Energy Healing is real. 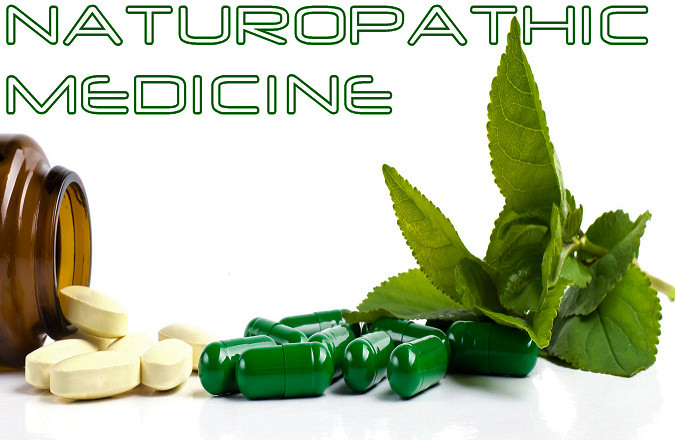 Energy is more effective at controlling biology than molecules are.” – Bruce Lipton. Ph.D. The VRCR works to increase various naturally based energies that are very important to human wellness and our environment. It also works with a type of information that is known to be “the guiding principle behind all form.” This source of information, or intelligence, comes from what Quantum Physics science now calls “The Field.” More specifically, the “Information Field.” Through the modern science of Epigenetics (meaning above or beyond genes), it is now known that much of our biology is controlled by information signals from the environment. The scientific study about the process and flow of information throughout our body and with the environment is called “Signal Transduction.” Materials Science research into water and Advanced Biological Studies now confirm that WATER plays a major role as a type of information delivery mechanism within our biology and without. Water has memory based on the way its molecules cluster together. Each process within our body works with water differently and creates what is called structured water that can deliver information and hold memory for its specific functions. Having healthy body water structure is VERY important to our genes and DNA. And you will be stunned to know how your Pineal Gland uses water! The VRCR outputs naturally based Electro Magnetic Fields that change and improve the structure of our bodies water as well as works with various energy fields of the body itself and so much more. 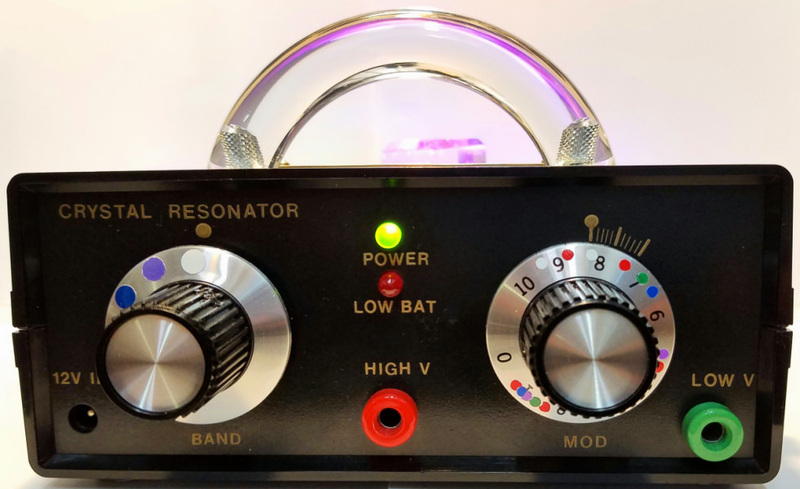 The Violet Ray Crystal Resonator is a Radionics Machine & a Holistic Health, Stress Reduction – attunement device that helps pull our physical bodies into resonance. Yet another is by using it as a Radionics Machine that enhances meditation technique, reduces stress, builds inner peace, invocation prayer for your self, others or global issues. The Violet Ray Crystal Resonator performs other functions like being a Reiki Attunement Device or an Energetic Feng Shui Healing Device for our living environments, our food & drink plus anything else receiving the Violet Ray, Golden Ray, Elemental Ray, Double Fold back Violet Ray & other subtle energies produced by this divinely guided multifaceted Radionics Machine. Note: A traditional “Chakra Balancing” is attempting to adjust the energy of each Chakra to be in accord with the others with no consideration given to the overall tuning of the entire system. In this sense, you could have a Chakra system that appears balanced to itself but is still improperly tuned to the orchestra of life. Our “Chakra Balancing & Tuning” means – adjusting the electromagnetic resonant frequency of ALL Chakras to be in direct Octave Resonance with the Schumann Frequency of the Earth & thus, properly tuned with respect to each other. When the chakras are properly balanced and tuned electromagnetically; (i.e. they are energy entrained) they are in an optimal state to then use their divine built-in wisdom to regulate and maintatin the body with all its proper physical vibration rates. When your EM field is maintained, your entire holistic presence is more receptive to your divine essence wisdom. “Chakras” are – regulating vortexial, electromagnetic centers of our bodies that are also ganglionic nodes that channel energy and information throughout the body. Tune and harmonize the chakras with electromagnetic resonance from the Crystal Wands and the harmonizing Chakras in turn will regulate your entire bodies health with their stable and strengthened Electromagnetic Shield. They bathe every cell in the most healthful and natural EM environment possible. So the Electro Mangetic Fields of the Chakras support each cell to vibrate at its divine physical frequency. In this way, there is no need to treat each type of cell with its own resonant “physical” vibration since the properly balanced and tuned “EM” vibration of each Chakra Center supports each cell to access its own innate wisdom. 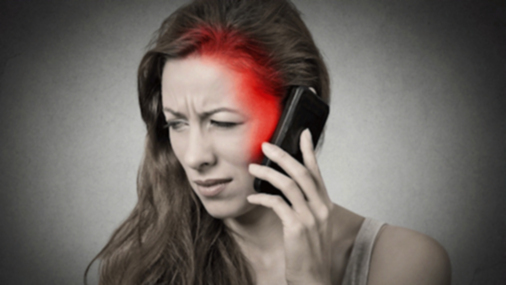 Why treat a symptom when you can treat the cause?